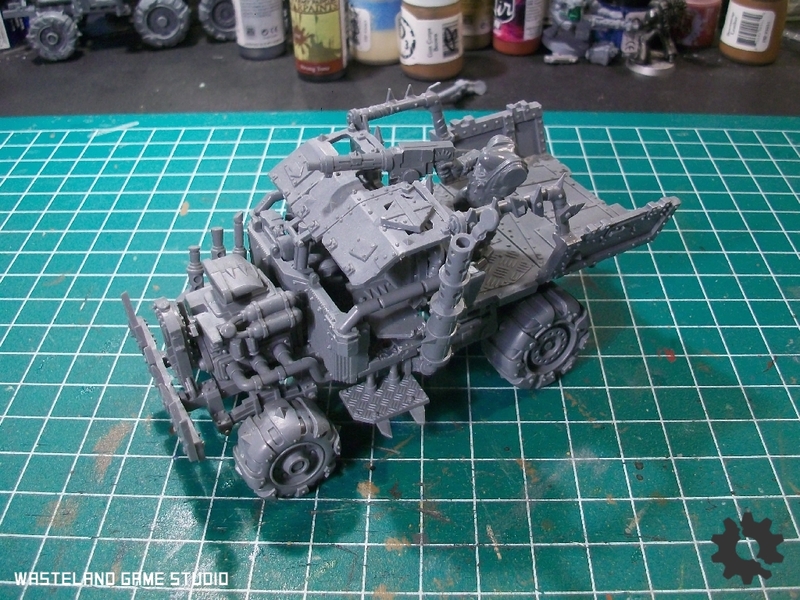 As promised, here’s a look at the expanded Ork Project and the painting plan I’m following. I’ll see if I can remember to take some in-progress photos as I work on the next batch. This is one of the first times I’ve worked with a grey primer coat en masse. 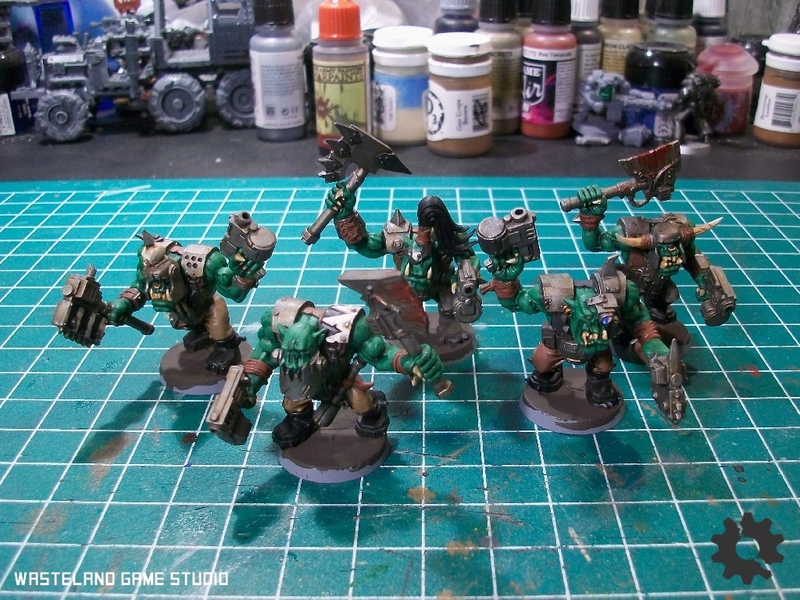 I find that it provides a base that colors like the ork’s green skin cover over much more easily than black, while still not looking as crazy stark as white would. It does lose the ability of black to create shadows and hide any missed spots, but I’ve found it’s not a huge problem since the scheme makes heavy use of washes. I’ve used Army Painter Uniform Gray spray. 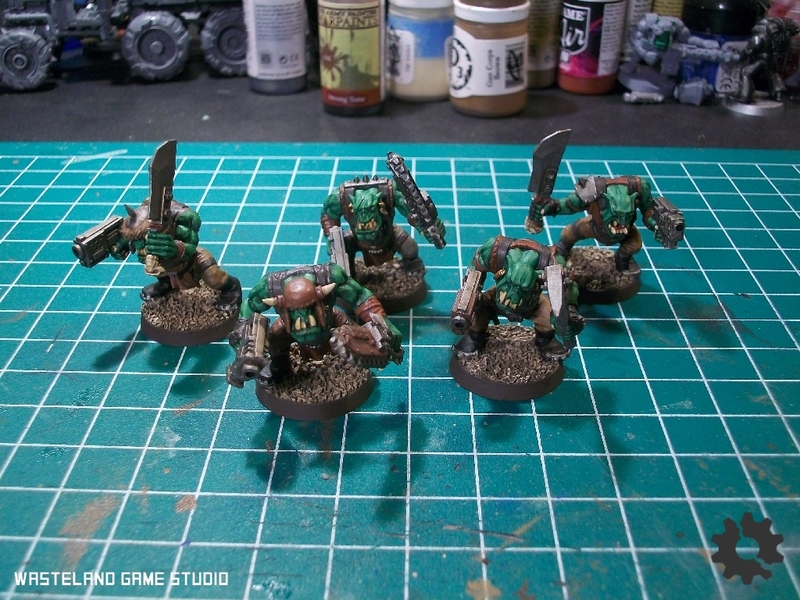 The base color for the skin is Army Painter Greenskin (huge surprise) but I’m applying it solely with a brush – most of the orks have only their faces and arms exposed so there’s not enough skin area to justify using Greenskin as the primer color. The first step is just a quick-and-dirty coat around the face and neck to get any areas I won’t be able to reach later. Shirt and pant colors are the first major step, and are mixed and matched haphazardly as befits the orks. The most common color is based on the paints I used on the Bommer, but applied by hand for the sake of neatness. It uses a base of Vallejo Surface Primer Red Oxide, followed by two coats of Model Air Rust. It doesn’t work quite as nicely as when it was airbrushed on the Bommer, but gets the job done here and keeps the same rusty-red palette. These will be Evil Sunz, but once again I’m trying to stay away from the traditional crimson red and give a more worn appearance. Other colors for the clothing are mostly P3, but I haven’t bothered to keep particularly close track of which ones I use where since I want things looking properly orky. They’re drawn mostly from a pool of Bootstrap Leather, Cryx Bane Highlight, Beast Hide, and whatever other browns and greys catch my eye. I’ve been using Dark Flesh as an accent color for wristbands, weapon hafts, etc but I’m now leaning towards mixing it in to the clothing colors just to bring out the red shades a bit more, which are perhaps a bit lacking with the first few batches. Dark Flesh is a really great color and it fits very well into the effect I’m trying to achieve. The straps are done with Model Color German Camo Black/Brown, although it’s effectively the same color as Game Color Charred Brown and I could really use them interchangeably. 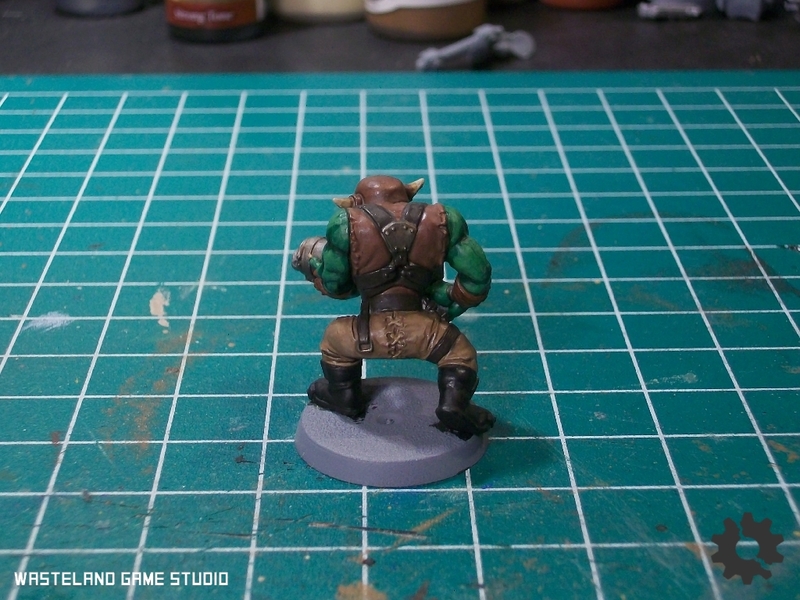 About here is where I’ll go back with Greenskin and finish the rest of the flesh areas – the paint has pretty good coverage over the grey base so it usually only takes one main coat plus occasionally another over the more exposed areas. 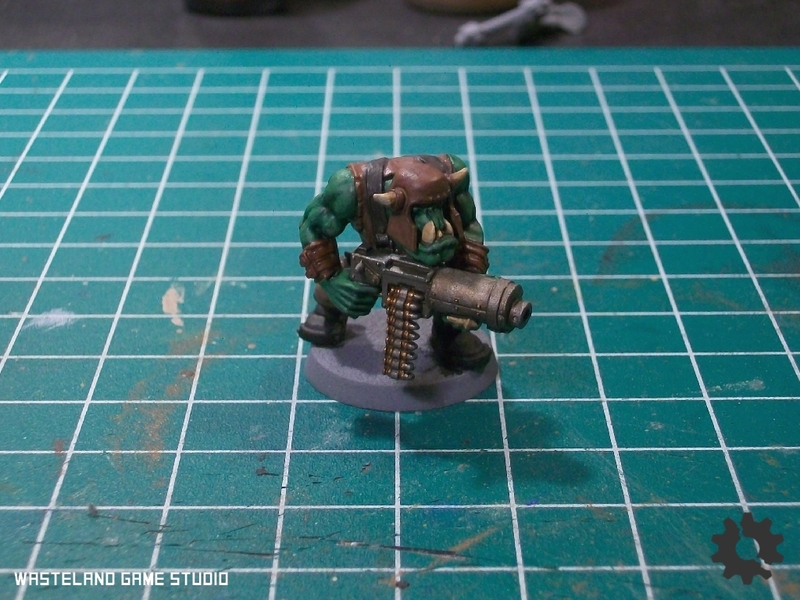 The finish for metal areas is pretty heavily dependent on later washes – the base is a simple coat of Model Air Gunmetal (if you’re not familiar with the Model Air line, this is a pretty standard Boltgun Metal kind of color). There’s only a couple more details to wrap up before the wash stage – black or the leather strap color for boots, Dark Flesh for wristbands and wraps etc, Game Color Brassy Brass on shell casings and earrings, and Bleached Bone on any skulls (I leave the teeth and claws for later). The first of the wash steps is over all of the skin – I still have a bunch of this older Citadel Wash color around, but my preferred substitute would be Army Painter Green Shade. This does most of the work of adding depth and richness to the skin. The primary wash is Army Painter Strong Tone (the water-based dropper bottle one, not Quickshade) over all the rest of the figure – this finishes a lot of the model in one go and in addition to shading grunges things up very nicely. This is my go-to replacement for Devlan Mud and I use the two pretty much interchangeably. The Strong Tone has dirtied down the metals a bit, but to finish them off I apply a deliberately blotchy coat of Soft Tone/Gryffonne Sepia shade. This is also applied over any bone areas, and I’ll usually pause before this wash to paint the teeth and claws in bone – those areas will then receive two coats of the sepia wash. Since I have like a million of these little bastards to paint I’ve limited myself to one main highlight step, on the skin. The color I’m using is Citadel Warboss Green – one of the very few of the colors from the updated range that I commonly use. I think I understand the idea behind the formulation of the layer paints, which seem to have universally poor coverage…they’re made specifically as a highlight paint, where their lack of opacity can be an asset for smoothing the transition between layers. 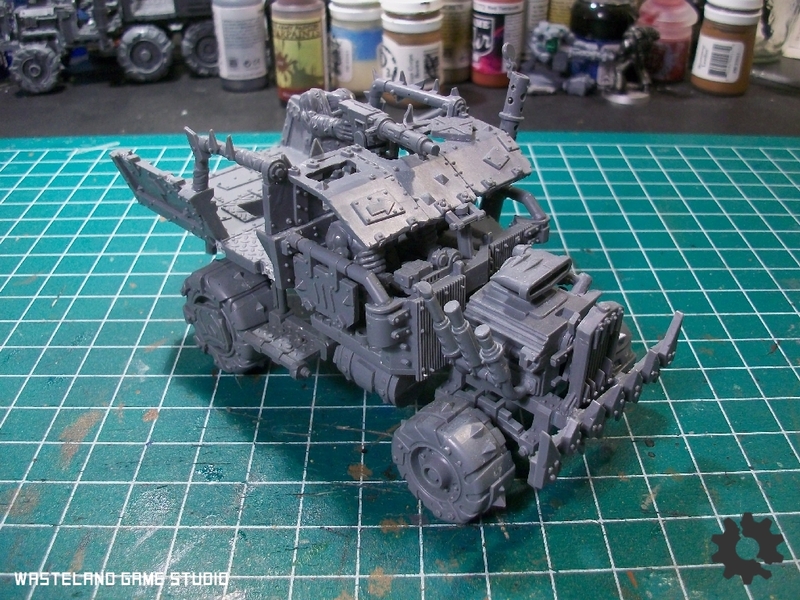 It works OK here on my ork skin, but it’s not really difficult to thin down a regular paint and use it in this manner. This leaves the Citadel range a bit hamstrung when you consider that so many of their colors can’t be used effectively as a base layer. 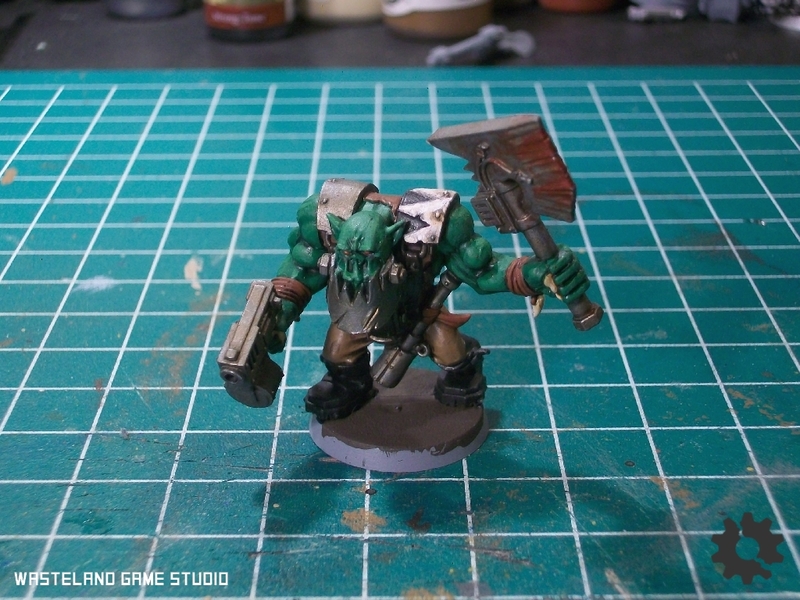 I tried to make the Nobs appear a bit darker by mixing the Warboss Green with the original Greenskin base at roughly 50:50. The result is OK but I’m not sure if it created enough of a difference to bother with. Lastly, any final details or touch-ups. The eyes are done with a small dot of Army Painter Pure Red. 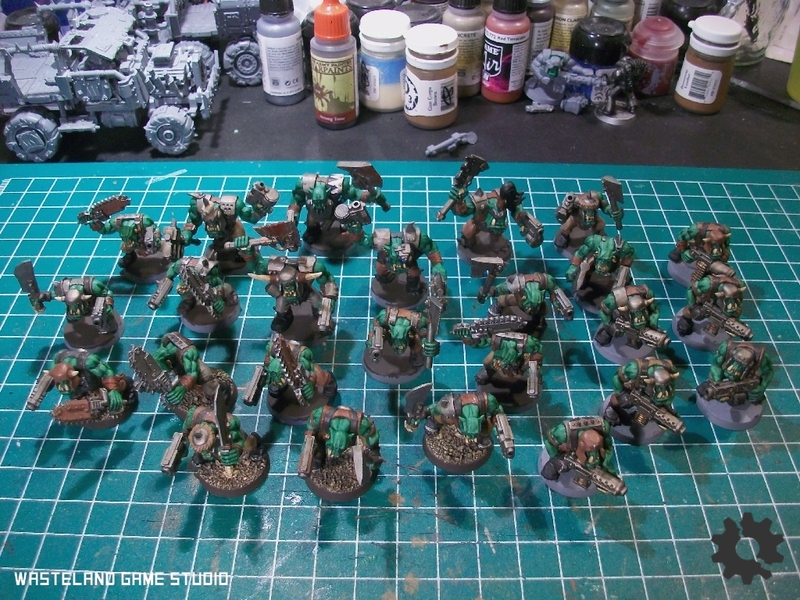 So about 20 orks down and probably like a hundred to go. I’m still wrapping up building and conversions on the first batch of vehicles, but my plan of attack will likely start with an airbrushed basecoat of Gunmetal. I really like the effect of the washes on metallics and this is probably the easiest way to cover the most area quickly. Rust-red will be the primary accent color, but I’m undecided if the best way to apply it will be via airbrush like on the Bommer, or by hand for greater control. Can’t find out til I finish building!